Escuela Naval Almirante Padilla. Facultad de Ingeniería Naval. Cartagena de Indias, Colombia. Universidad del Cauca. Facultad de Ingeniería. Popayán, Colombia. 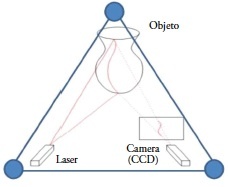 This article presents the design and implementation of a novel method to generate 3D coordinates from the projection of a laser line over a solid object and the processing of the images obtained during scanning. The result obtained is a 3D model of an isometric view that provides the possibility of being seen from different perspectives under a virtual environment. The methodology is applied in the capture and reconstruction of 3D images of objects submerged in murky waters. CACCIA, M. (2007). Vision-based ROV horizontal motion control: Near-seafloor experimental results. Control Engineering Practice, Vol. 15, pp. 703-714. DEMA, M.A. (2006). 3D Reconstruction for Ship Hull Inspection. Master Thesis. Heriot Watt University. Scotland, UK. DESERTSTAR, "Ship hull inspections with AquaMap", 2006, www.desertstar.com. MONTALVO, M. “Técnicas de visión estereoscópica para determinar la estructura tridimensional de la escena”. Tesis de Maestría. Universidad Complutense de Madrid. 2010. RAMÍREZ, J., VÁSQUEZ, R., GUTIÉRREZ, L., FLÓREZ, D. (2007). Mechanical/Naval Design of an Underwater Remotely Operated Vehicle (ROV) for Surveillance and Inspection of Port Facilities. Proceedings of IMECE2007 ASME 2007 International Mechanical Engineering Congress and Exposition, Seattle, Washington, USA. REED, S., CORMACK, A., HAMILTON, K., TENA I., LANE, D. (2006). Automatic Ship Hull Inspection using Unmanned Underwater Vehicles. Proceedings of the 7th International Symposium on Technology and the Mine Problem. Monterey, USA. May, 2006. VAGANAY, J., ELKINS, M., ESPOSITO, D., O’HALLORAN, W., HOVER, F., KOKKO, M. (2006A). Ship Hull Inspection with the HAUV: US Navy and NATO Demonstrations Results. IEEE/MTS Oceans’06, Boston MA, USA, Sept. 18-21, 2006. VAGANAY, J., ELKINS, M., ESPOSITO, D., O’HALLORAN, W., HOVER, F., KOKKO, M. (2006B). Hovering Autonomous Underwater Vehicle for Ship Hull Inspection: Demonstration Results. Undersea Defense Technology Pacific (UDT Pacific ’06), San Diego CA, USA, Dec. 6-8, 2006. ZAINAL, Z.B. (2007). Development of a Vision System for Ship Hull Inspection. Master Thesis. Universiti Sains Malaysia.